This page will highlight some of the teams which worked on these types of projects in 2013. Abstract: The ToxiMop project attempts to tackle the problem of freshwater algal blooms by detecting, reducing, and reporting the levels of the algal toxin microcystin. This toxin causes liver damage and is also speculated to be a carcinogen. Microcystin’s toxic action lies in its ability to bind to the human Protein Phosphatase 1 (PP1), which is a major regulator of cell division, protein synthesis and other essential processes. Using synthetic biology techniques, we engineered bacterial chassis (E. coli and B. subtilis) to express PP1, which covalently binds to microcystin. The engineered bacteria can then be used as a molecular mop, the ToxiMop, to remove microcystin from contaminated water. Applying mathematical modelling to our experiments, we optimised our prototype ToxiMop. Additionally, we attempted to develop a biological detector for microcystin, which was combined with our electronic device, the Moptopus. This device has the potential for real-time monitoring and analysis of water bodies. Abstract: Atrazine, a widely used herbicide, persists for a long period in the environment onced used. It causes metabolic disorders in both animals and humankind. Our team utilized the ribosome switch induced by atrazine, a QS system of Plux and a degrading enzyme to control E.coli’s motility through regulating its CheZ gene. Therefore, E.coli can recognize atrazine, recruit team workers, and degrade atrazine. Our team found a transporter of atrazine, which we call TRM. We also mutated the degrading enzyme, TrzN, making it better at degradation. We combined TRM and the TrzN to improve atrazine absorbance and degradation. Moreover, our team are trying to analyze and compare several systems with computer, hoping to find the best one which is equipped with faster moving and quicker degrading. Overall, we believe our system will boost the industrialization, universalization as well as standardization in the field of treatment for atrazine and other versatile small molecules. Abstract: This year we aim to utilize aptamer to specifically detect and clear molecules of different sizes. In order to detect and clear certain protein, we make tunneled E.coli called bacterial ghost that allow protein to diffuse in. We then build two types of inner-membrane protein scaffold, which will dimerize when pulled together by two aptamers attached to two sites of the protein. The dimerized proteins have enzymatic activity that can be detected via commercial test strips. The device will also sequester the proteins and allow us to clear them. In order to efficiently detect and clear a small molecule called atrazine, which is an herbicide causing tremendous environmental problems, we split our aptamer-based detection module and clear module into two strains. The first strain is chemotaxic to atrazine and will release quorum sensing molecules to attract the second strain, which contains atrazine hydrolase to clear it. Abstract: The picturesque city of Sydney is marred by industrial efflux of chlorinated hydrocarbons into the aquifers around Botany Bay. 1,2-dichloroethane (DCA) is toxic and a suspected carcinogenic agent, and one of the more soluble and mobile contaminants. Conventional DCA treatment is both costly and time-consuming, involving pumping and heat-stripping groundwater. We propose a biological alternative which may be cheaper and more effective. There are strains of bacteria able to degrade low levels of organochlorine compounds in selective conditions. Polaromonas JS666 and Xanthobacter autotrophicus GJ10 contain two pathways of particular interest. Our goal is to construct our own versions of two metabolic pathways of DCA biodegradation for comparison in a BioBrick-compatible vector, and characterise their effectiveness in utilising DCA as a sole carbon source for growth. We hope to create friendly strains of bacteria capable of removing DCA at greatly reduced cost and effort, and reduce the environmental impact of industry. Abstract: The contamination of aquatic ecosystems with multiple anthropogenic pollutants has become a problem since the industrial revolution. Antibiotics, hormones and various noxious substances threaten environmental health and are not effectively removed by conventional waste water treatment. We propose to employ transgenic plants which produce effectors for enzymatic degradation (BioDegradation) or specific binding (BioAccumulation) of pollutants. The autotrophic, sedentary, aquatic nature of the moss Physcomitrella patens makes it an ideal chassis for a self-renewing, low-maintenance and cheap water filter. A light-triggered kill switch prevents unintended environmental spreading by limiting viability to places where the spectrum of sun light is appropriately filtered. Furthermore, we have developed a device to implement this biological filter in an aquatic environment, investigated the application of this new technology and examined its economic feasibility. Based on our results, PhyscoFilter may become a game-changing approach to improve global water quality in an affordable and sustainable fashion. 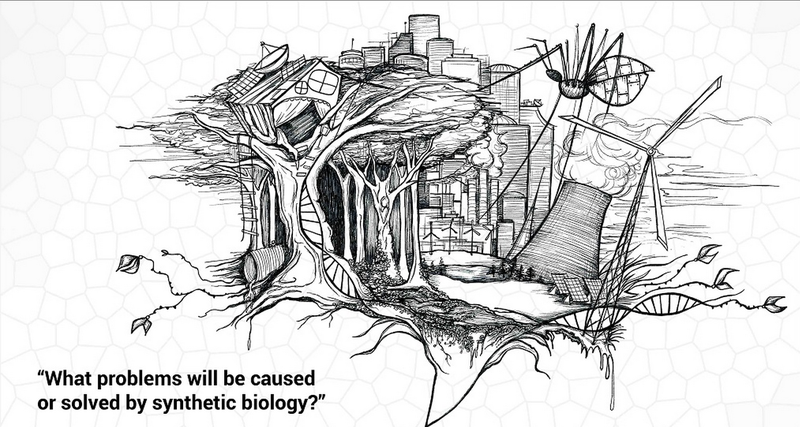 Abstract: Accumulation of waste represents a considerable problem to humanity. Over the next 50 years, the global community will produce approximately 2 trillion tonnes of waste, or 2.5 times the weight of Mount Everest. Traditionally, mixed non-recyclable waste is sent to landfill or for incineration, both of which result in environmental damage. The detrimental effects are perpetrated by the plastic degradation into toxic byproducts and the production of greenhouse gases by these processes. 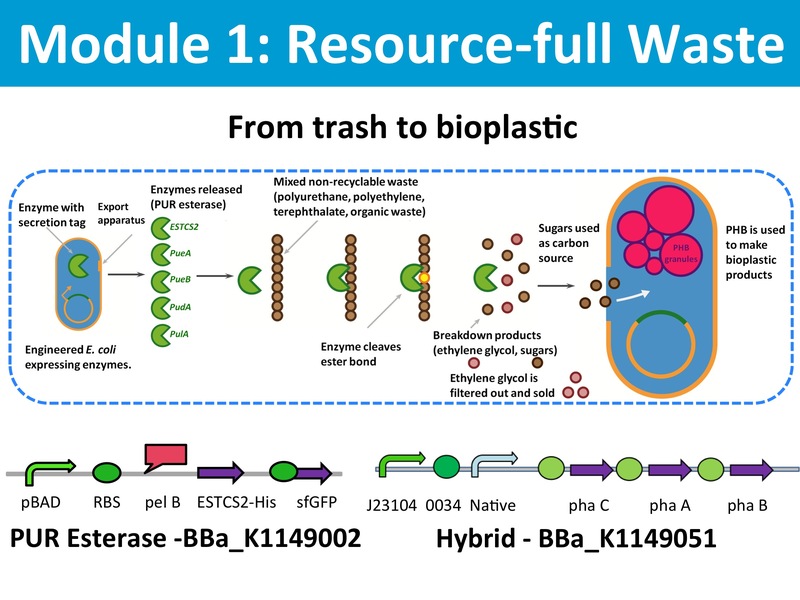 As an alternative we propose to upcycle this mixed waste into the bioplastic poly-3-hydroxybutyrate (P3HB) to create a closed loop recycling system. Our engineered E. coli will operate within sealed bioreactors. In the future we picture the use of our system in a variety of contexts as part of our M.A.P.L.E. (Modular And Plastic Looping E.coli) system.